If you’re looking for an SUV with power, fuel-efficiency, technology and off-roading capability, look no further than the 2018 Toyota 4Runner at Toyota of Tampa Bay. the highways of Florida and beyond in style and comfort. Built around a durable body-on-frame construction for added all-terrain confidence, the 2018 Toyota 4Runner is powered by a standard 270 hp 4.0L V6 capable of towing up to 5,000 lbs! That means even at the base trim you can enjoy the legendary adventurous 4WD SUV you’ve always wanted at a great price! The new Toyota 4Runner also comes in other trims featuring even more powerful options. With 4×2 or 4×4 drivetrains for the SR5, Trail, and Limited trims, and a 4×4 option for the TRD Pro, the 2018 Toyota 4Runner is a versatile and capable SUV for drivers from Tampa, Wesley Chapel and Brandon. Being off-road doesn’t mean you can’t enjoy the best in comfort and entertainment technology. With third-row seating, room for 7 passengers, and a versatile 89.7 cubic feet of cargo space, the 2018 Toyota 4Runner delivers a comfortable and connected ride towards your next adventure! Toyota is committed to keeping you and your passengers safe on the streets of Tampa and the highways of Florida, that’s why every new Toyota 4Runner now comes standard with Toyota’s Star Safety System! 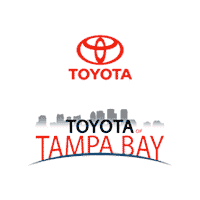 Plus, every new Toyota 4Runner in Tampa comes with 2 years/25,000 miles ToyotaCare no-cost maintenance. If you’re looking for a family-sized SUV that’s tough enough for any job in Tampa, Wesley Chapel, Brandon or the surrounding areas, fill out the form and test drive the 2018 Toyota 4Runner at Toyota of Tampa Bay! We have an extensive selection of new 4Runners, so stop by today and ask us about our special offers, low MSRP and attractive financing solutions. Super White 2019 Toyota 4Runner SR5 4WD 5-Speed Automatic with Overdrive 4.0L V6 SMPI DOHC 4WD, Blk Graph Low Fabric. Gray 2019 Toyota 4Runner SR5 4WD 5-Speed Automatic with Overdrive 4.0L V6 SMPI DOHC 4WD, Blk Graph Low Fabric. Super White 2019 Toyota 4Runner SR5 Premium RWD 5-Speed Automatic with Overdrive 4.0L V6 SMPI DOHC Sand Bge Synthetic Artificial Leather. Gray 2019 Toyota 4Runner SR5 Premium 4WD 5-Speed Automatic with Overdrive 4.0L V6 SMPI DOHC 4WD, Blk Graph Syntheti Artificial Leather. Classic Silver 2019 Toyota 4Runner SR5 Premium 4WD 5-Speed Automatic with Overdrive 4.0L V6 SMPI DOHC 4WD, Blk Graph Syntheti Artificial Leather. Super White 2019 Toyota 4Runner SR5 Premium 4WD 5-Speed Automatic with Overdrive 4.0L V6 SMPI DOHC 4WD, Sand Bge Synthetic Artificial Leather. Super White 2019 Toyota 4Runner SR5 Premium 4WD 5-Speed Automatic with Overdrive 4.0L V6 SMPI DOHC 4WD, Blk Graph Syntheti Artificial Leather. Gray 2019 Toyota 4Runner SR5 Premium RWD 5-Speed Automatic with Overdrive 4.0L V6 SMPI DOHC Blk Graph Syntheti Artificial Leather. Recent Arrival! Gray 2019 Toyota 4Runner Limited RWD 5-Speed Automatic with Overdrive 4.0L V6 SMPI DOHC Blk Graph Lth. Recent Arrival! Blizzard Pearl 2019 Toyota 4Runner Limited RWD 5-Speed Automatic with Overdrive 4.0L V6 SMPI DOHC Blk Graph Lth. Black 2019 Toyota 4Runner TRD Off-Road Premium 4WD 5-Speed Automatic with Overdrive 4.0L V6 SMPI DOHC 4WD, Blk Graph Syntheti Artificial Leather. Blizzard Pearl 2019 Toyota 4Runner Limited 4WD 5-Speed Automatic with Overdrive 4.0L V6 SMPI DOHC 4WD, Sand Bge Lth. Super White 2019 Toyota 4Runner TRD Pro 4WD 5-Speed Automatic with Overdrive 4.0L V6 SMPI DOHC 4WD, Blk Graph Syntheti Artificial Leather. Recent Arrival! Black 2019 Toyota 4Runner TRD Pro 4WD 5-Speed Automatic with Overdrive 4.0L V6 SMPI DOHC 4WD, Blk Graph Syntheti Artificial Leather.